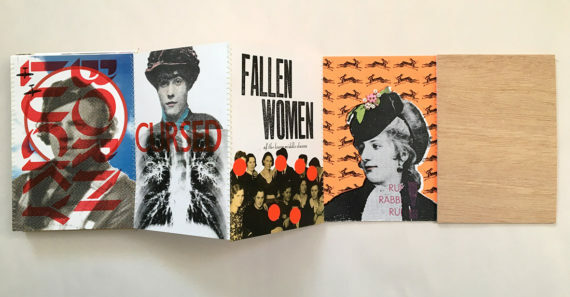 Sarah Bodman, senior research fellow at UWE Bristol's Centre for Fine Print Research and writer of a-n's Artists' Books series, picks her ten favourite publications of the year. What I love about this book is that it is a wonderful example of creating complex imagery in collaboration with technology. Known for her work with digital and analogue reproduction technologies, Untitled (Weave) is one of two books American artist Leah Mackin made as performance pieces during a summer residency. Mackin took part in the Fugitive Arts 2×3: A Generative Artwork Residency Project at A.P.E. Gallery in Northampton, Massachusetts. 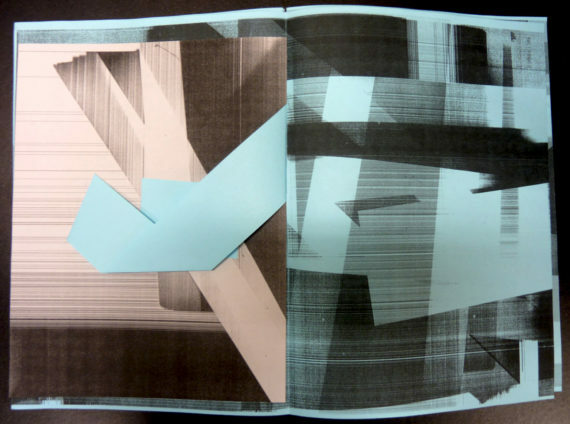 Having set the photocopier to generate artwork by double-sided copying blank sheets of paper, the artist has really pushed the boundaries of the process, incorporating folds and cuts to create possibilities through tactile interaction. It invites the viewer to feel their way through, with every turn of the page offering a new visual experience of depth and scale. Martha Hellion has published consistently thought-provoking books for many years. Co-founder of the Beau Geste Press with Felipe Ehrenberg in the early 1970s, Hellion has since travelled around the world from her base in Mexico City. 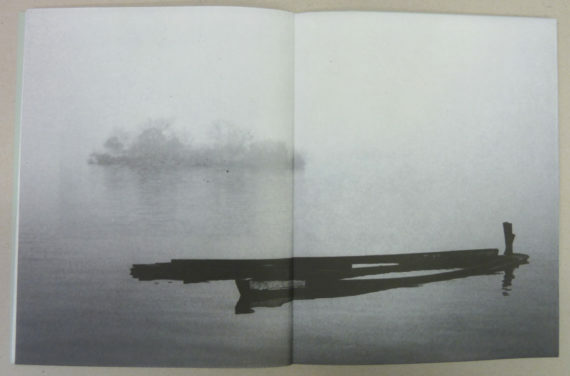 Field Work is selected from hundreds of photographs taken on her travels through China, India, Brazil… Everything about these books is perfect – they visually represent her continual transience. Delicate Kozo papers transport us into her world, drawing attention to those beautiful, fleeting moments we witness in both the landscape and our lives. 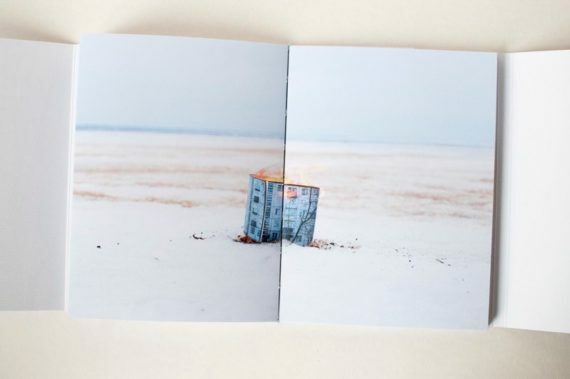 Estonian-born, Russian-based Julia Borissova makes beautiful photographic collage books, often bound by hand, which include exquisite details (see Running to the Edge or the wonderfully titled J.B. about men floating in the air). DOM – a home or household in the Russian language – considers how people feel and what they remember about the homes they occupy, and what that means in today’s ever-changing world. DOM, as an acronym for Document Object Model, is also a structure for data in formats such as HTML or XML. This interpretation of the word DOM can also be seen in the book – part document, part object – with the photographs featuring a model of a home. As with all of Borissova’s works, the subtle use of underlying collage and atmospheric photographic details allow the viewer to delve more deeply into the past and the present, and appreciate that there is always more to a subject than initially meets the eye. 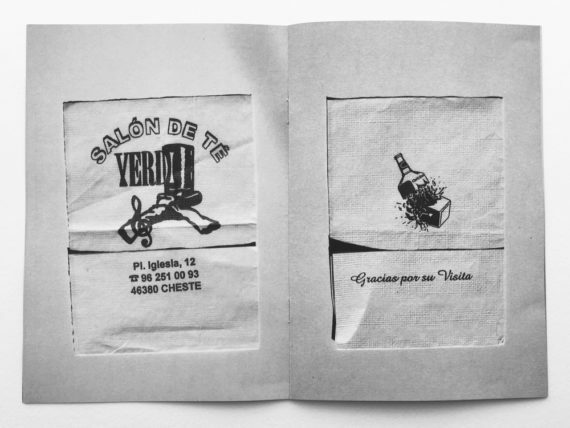 This is the second edition of Spanish Serviettes (first printed as an edition of 50 in 2007) by Craig Atkinson, well-known for his social history publishing project, Café Royal Books. It’s not often I spot his own name on CRB’s ever-growing list of new titles, so it was nice to see this one over the summer. It’s a great book, containing Atkinson’s black and white photographs of those iconic disposable napkins used to clean hands, mop up spills, etc – part of the general day-to-day in so many Spanish cafés and bars. They have been photographed here in such a way that you want to touch them; you can almost feel their textures. And, as with all Café Royal publications, the book provides a snippet of social history for the price of a supermarket snack. Completed in January, this book – from Ian Andrews’ series of hand-drawn, large-scale, loose-leaf artists’ books, The Shuffle of things – is absolutely exquisite. Full of dense, colourful imagery on a jet-black background, it is reminiscent of a richly woven tapestry. It isn’t, however, a celebratory book – these images are derived from media photography and broadcast imagery of catastrophes. That’s not a beautiful firework display you’re viewing, it’s a life-threatening fire, drawn from real events including the Tottenham riots and a NASA rocket launch explosion. Andrews is concerned with how we experience things second-hand via the media even when we are physically present. You can watch (and listen to) a video of the whole book on YouTube (see above). It’s hypnotic yet unsettling; the rustle of the tissue paper sounds akin to the crackle of flames, but also has that eerie sense of disconnection, as if something is happening at a distance and you aren’t sure if it is moving closer or further away. I recommend a visit to his YouTube channel for more examples. 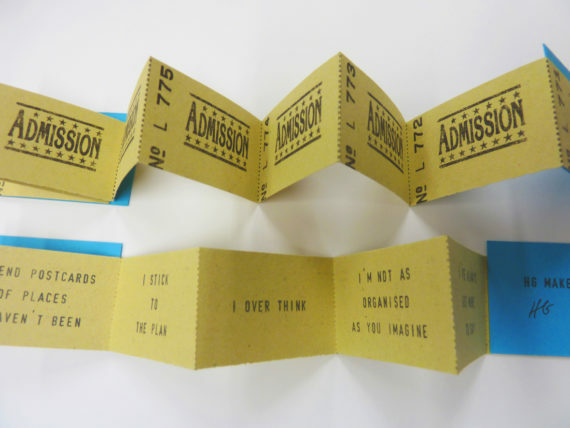 Potentially the smallest book this year, measuring just 53x34mm, this is the fourth and final edition in HG Makes’ series of Small Admissions, owing to the artist having finally depleted the entire roll of vintage admission tickets in her possession. Grainger’s book-making policy is one of re-use and recycling, making small bookworks from old maps, books and even postal packaging. Each book in Small Admissions, released at one edition per year, contains a selection of tiny, rubber stamped, hand-bound confessions such as, ‘I send postcards of places I haven’t been’. Egidija Čiricaitė is a founding member of Collective Investigations, a group of artists exploring experimental publishing in relation to artists’ books and wider reading/book culture. 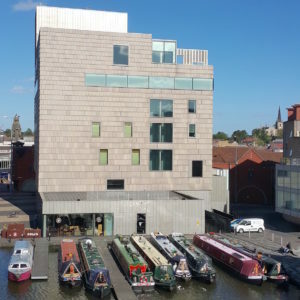 They are currently working with Arnolfini’s archive on new work for the Bristol Artists Book Event next April. This book was produced earlier this year for the AMBruno Words project, designed using systematic rules that imitate a creative thinking process. These were “accumulated using British National Corpus at Brigham Young University” to compose a poem within a larger textscape. 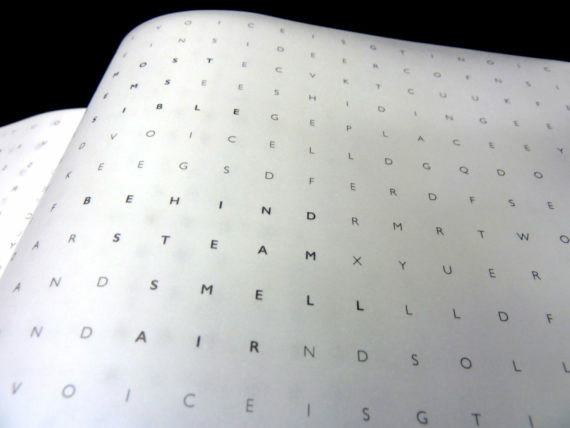 It’s elegantly presented on translucent papers delivering the words as ethereally as the steam from the teacup, the aroma of chicken broth, and the memories that are evoked and disappear. 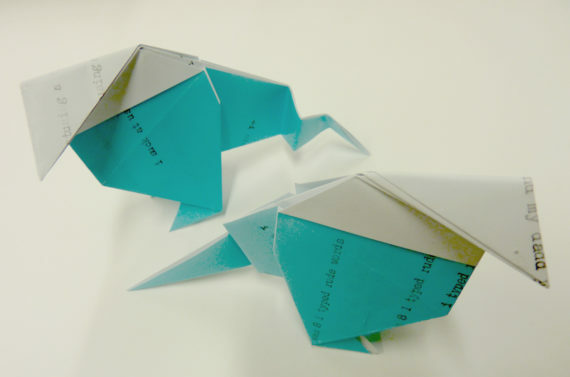 Philippa Wood of The Caseroom Press spent the summer collaborating with Tamar MacLellan on an artists’ book. The work explores the social histories of 36 villages within the 88-mile Jurassic Way walk between Banbury and Stamford, the respective home towns of the two artists. Each village is represented by a ‘portrait’ with text on the reverse, and is beautifully presented through the use of found imagery, collage, letterpress, relief and screenprinting, as well as the foiling and stitching that is always so particular to their books. 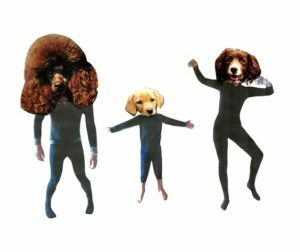 The artists have generously shared the context and process of their collaboration via a project blog providing detailed insight into the creation of the work and the historical data gathered. It’s a lovely example of artists working together and how social history can be interpreted visually. 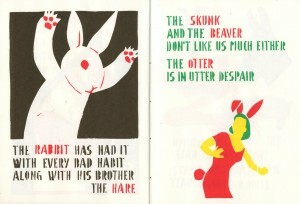 Screenprint, relief print, rubber stamps. 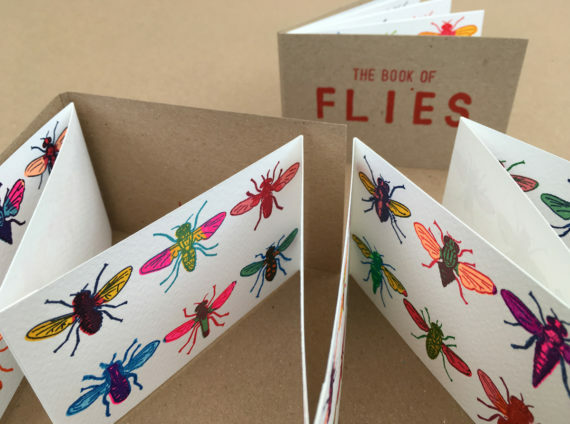 Edition of 250, 2016, 11 x 7cm, 8 pages, 48 flies.